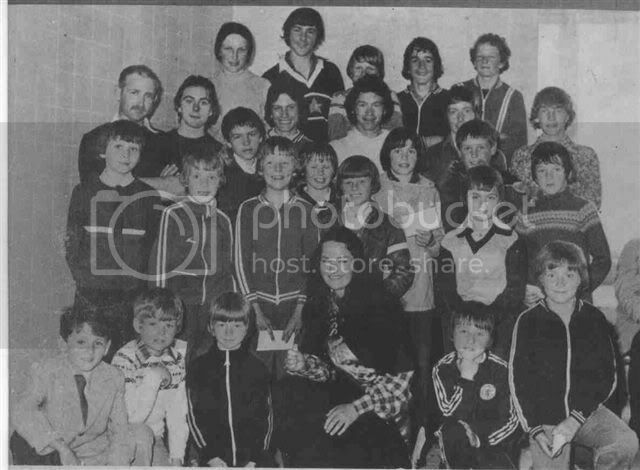 The Kintyre Forum • View topic - Photo from the 70s - anyone help? Received this photo tonight - a scan of a photo found in an old Courier. Can anyone help with the year, the event and the names of the people in the photo? I know a few - lot less hair nowadays mind you! Re: Photo from the 70s - anyone help? That photo is taken in the old swimming pool. It was the prizegiving for a 5-a-side tourney on the wee pitch at Kinloch. There were different age categories. I know some names but the memory may fade. Right at the front : Campbell Cunningham, John Brodie, Andy (Bulb) Thomson, Campbell McKellar and Peter McPherson. The lady in the middle was the Festival Queen and is Lorna ?? Could be doing with a hair cut there Rab. Lorna MacCallum, from near Tayinloan. She'd have been around 17 then, so 1977 seems about right, Robert.